A few years ago when I was transferred, I moved into a rectory in Cambridge, MA. At the same time, a newly retired priest also moved into the rectory. I had known Fr. Tim Murphy since my seminary days, and my fondness for him and my respect for him grew the more I got to know him. When we were neighboring pastors, I would occasionally go to him for confession. The rectory in Cambridge has a great porch, and Fr. Murphy would often be found sitting there, pipe in hand, smoking and reading a book. I could sit and talk to Tim for hours. And clearly, Tim enjoyed being listened to! He was a great story teller and had a boyish laugh when he got going. His whole body would shake when he'd laugh. He loved to tell stories about his seminary days, about various "characters" in the Boston presbyterate, and about his travels. A particular favorite was the story of him being held by the police while in Rome. In Italy, public transportation is kind of on the honor system. You are supposed to buy a ticket and then, when you get on the bus, validate the ticket in this machine. Tim had forgotten to validate his ticket. Tim loved to tell the story. "Well, these three people get on the bus and the doors close. And then, one of them pulls this hat out from under his jacket and places it on his head. It was a raid. You could tell that he was VERY proud of this uniform hat. They began inspecting tickets. When they got to me, I just kept holding up my hands saying, 'I don't speak Italian.' Then, this know-it-all next to me starts to translate everything. The last thing I wanted him to do is translate for me. With that, they took me off the bus, and marched me to the police station where I was held for sneaking on the bus." Tim would say, "The whole way down the street, they kept their hands on their guns like I was a dangerous criminal." More than his funny stories, what I will most remember about Tim is that he really loved being a priest. When he turned 75, he did not want to stop working. He wanted to keep going. In fact, he kept helping out wherever and whenever he could. And, Tim always wanted to be a better priest. When you spoke with Tim, you felt like he was still discovering what it means to be a priest. Tim was still surprised by Christ. The Gospel was still moving and surprising to him. The priesthood was still an adventure to him. This morning, Fr. Timothy J. Murphy, in the words of the Roman Martyrology, "fell asleep in the Lord." As one friend put it, "It's sad for us, but we have to be happy for him." Tim spent his life being surprised by the miracle of Faith and the joy of priesthood. I imagine that such awe before the Mystery was a great preparation for the Glory of Heaven. There, the saints must live in an eternal state of joyful surprise at the goodness of the Lord. This evening, when I offered Mass at the BU Catholic Center, I prayed that the Lord might raise up for the Church in Boston more vocations to the priesthood. Fr. 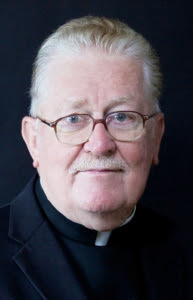 Tim Murphy lived a long and happy life as a priest. He joyfully preached the Word and administered the Sacraments to the flock. And, it never grew boring or routine for him. Priesthood is a great life. We live perpetually in that moment when Christ said, "Come, follow me." Priesthood is always new. May the Lord grant to Fr. Timothy Murphy an eternity of youthful and joyful awe.